When researching new blog posts, I often turn to the questions I am asked the most, and this question is certainly asked a LOT. Just after I decided to write about this topic I got a lovely email from Alexis at www.kissofdew.com (a website celebrating natural health & beauty) requesting to join my affiliate crew. On her website Alexis had already answered this question beautifully so I asked her if I could share it. Head on over to her website to read her other great posts too. The terms “moisture” and “hydration” are often used interchangeably in terms of skin care. This is SO WRONG. 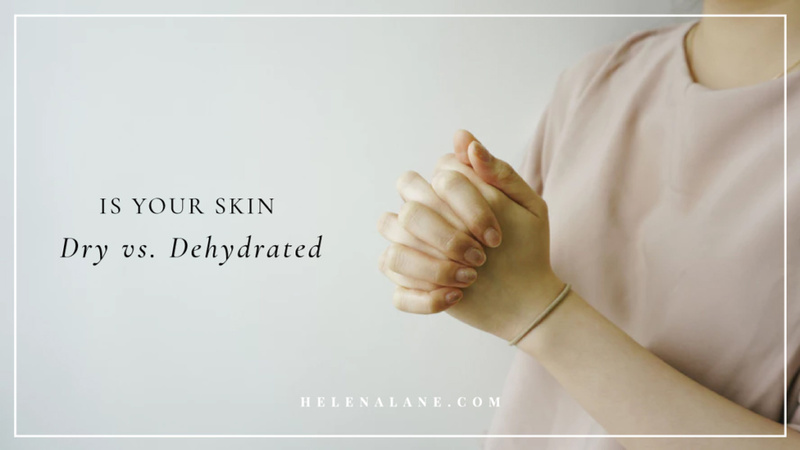 The underlying problems of dry skin and dehydrated skin are completely different things, so they often need to be treated differently. It’s linked to genetics, age, climate, and hormones. If you have dry skin, you’ve probably been dealing with it for a while and may have seen it progressively get harder to deal with if it’s related to age. As we age, the natural barrier of our skin slightly breaks down, causing oil to leave the surface. This is why dry skin as a skin “type” can be linked to aging. DEHYDRATED skin lacks water. Dehydrated skin is a skin “condition”. Any skin “type” can be dehydrated. Dehydrated skin doesn’t discriminate; it will affect dry, oil, normal, sensitive, or combination skin. By understanding the differences, we can get to the bottom of the problem and treat it accordingly. If you have dry skin, oils are your skin’s best friend. Don’t go for oil-free cleansers and moisturizers, actually reach out for oils to put on your face. Jojoba oil is my favorite because it is a natural oil that most closely mimics the natural oils that we produce and won’t make you break out. Try adding some healthy fats to your diet as well. Almonds, olive oil, and avocado are great diet staples that are full of healthy fats. When we consume these, our skin is able to produce more oil, so this will help your skin from the inside. Use gentle products. This may be the most important thing for those with dry skin. Harsh chemicals or soaps will break down oil on the skin and wash it away, which is the opposite of what your skin type needs. So, if your skin just isn’t feeling or looking how it usually does and seems lackluster or more sensitive, it’s probably just dehydrated. If you have dehydrated skin, water is your pal. That seems obvious, but we often forget that our skin is an organ. However, when we don’t drink enough for our body, it’s the last organ to receive water. Our body will give water to our heart, lungs, kidney, and everywhere else before your skin sees a drop. So make sure to up your water intake if your noticing dehydration in the skin. This could be the easiest and most effective way to help your skin. Topically, hyaluronic acid is the best way to go. It attracts water to the skin and holds it there. It can hold 1,000x its weight in water. Hot showers, sun exposure, and central air or central heating may also contribute to dehydrated skin. Add a humidifier to your room or where you spend most time if you have a high central heating or cooling system. You can read the final part of Alexis’s blog here, where she identifies specific ingredients to avoid and products to try. I have created Helena Lane products to make it really easy to tailor your oil and water needs to your skin type. I believe almost everyone needs both oils and water, just in different proportions. That’s one of the reasons why I formulated my oils and waters to be in separate products. Use the information in this blog to help you identify your skin’s needs and then apply your products in the right proportions, more water? Or more oils? The oils are found in my Moisturizers and Oil Serums and water is found in my Flower Waters and Water-based (hyaluronic) Serums. Shop all my oil and water-based skincare on my website. When you make an investment in Helena Lane skincare, you not only get beautiful skin but a wellspring of knowledge – thank you Helena! !